Easily turn any room into a spare bedroom with the AeroBed One-Touch Comfort Air Mattress. The antimicrobial treated sleep surface resists odor, mold, mildew and fungus on the product, so you can offer a bed to your friends and family with confidence. The built-in One-Touch Comfort pump lets you easily inflate the mattress without bending down, and if your guests need a little more firmness after the mattress is inflated, they can use the pump control wand to add air without getting up. If your guest wants a softer feel, they can simply press the firmness adjust button on the integrated Whoosh valve to let out small amounts of air and find the perfect comfort level. Once inflated, your guests will sleep in comfort thanks to the patented stability base that provides extra support. The next morning, they will wake feeling like they spent the night in a traditional bed, especially since the 17-inch height makes it easier to get up. 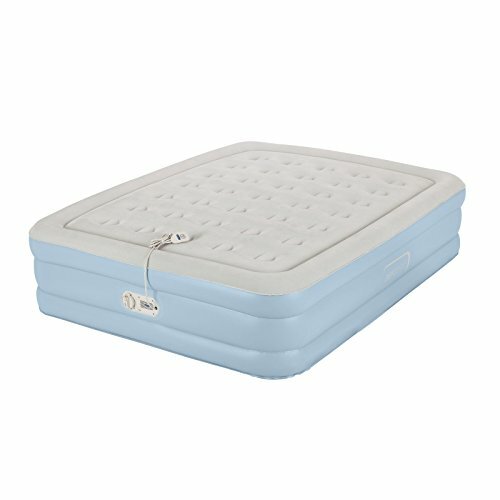 When you're ready to pack up, open the integrated Whoosh valve completely to deflate the bed easily, and the carry bag offers simple storage until the next blissful night. Approximate inflated dimensions: 78"X 60" X 17"